The bidding battle to stream the NFL’s Thursday Night Football games played out publicly -- and now there’s a victor. Google (GOOGL), Facebook (FB), Amazon (AMZN), Verizon (VZ), Yahoo (YHOO) and CBS were all said to be involved in the process at some point, but on Tuesday, the NFL announced it has “selected” Twitter. Why so cheap? Yahoo, for its game, had full freedom to sell all of the advertisements during the stream. Twitter doesn't get that right: the national advertisements that run on CBS and NBC during the games will also run in the Twitter live-streams. It will be able to sell a small portion of the ads, equivalent to the portion of local ads you see on TV during a game. Nonetheless, this was a very smart move for Twitter. Why? To re-work the old Ronald Reagan aphorism: It’s football, stupid. The NFL is a $12 billion sports cash cow, and it isn’t going anywhere. No high-profile Will Smith movie about concussion fears will change that. It is the king of the American sports hill, and it’s no wonder so many tech companies vied for the chance to have its games. With live football comes eyeballs, and with the promise of eyeballs come advertisers. Twitter will be able to sell ads against the games (albeit just a small portion), a key source of new revenue at a time when better financial performance is crucial for the public company, which has been under fire for failing to monetize its platform enough. NFL Commissioner Roger Goodell mentions advertising in his statement about the deal: “This agreement also provides additional reach for those brands advertising with our broadcast partners.” You bet it does. But it also provides additional reach for the NFL. In fact, it was the appeal of Twitter's global reach that convinced the league to turn down higher offers. Instead of taking top dollar, the NFL prioritized international eyeballs. An NFL spokesperson confirms it, telling Yahoo Finance: "It was a reach decision, more than anything." When Yahoo streamed its game last season, it said more than 30% of views came from outside the U.S.
Goodell took to Twitter, appropriately, to first share the news, including a video in his tweet that gives a good indication of the crisp quality that fans will expect Twitter’s NFL streams to deliver. A source close to the deal tells Yahoo Finance that finding the streams, on Twitter.com and on Twitter's mobile app, will require no extra hunting by users. (It is unclear if the streams will be as easy to find on third-party mobile apps like TweetDeck or Echofon, so this deal may also boost use of the official Twitter app.) Watching the streams won't even require logging in to Twitter. When Yahoo streamed its Sunday morning game live from London last year, some criticized the company for having the stream auto-play on the Yahoo homepage, helping to goose the viewer numbers. But it is likely that the streams will be equally front-and-center, if not auto-playing, on Twitter. You can also expect Twitter to work the streams into its still-new Moments feature, which could present live tweets alongside video. As Twitter CEO Jack Dorsey said in a press release, "People watch NFL games with Twitter... Now they'll be able to watch right on Twitter Thursday nights." There will be 16 Thursday Night Football games next season. Verizon has the rights to show six of them to Verizon customers through the NFL Mobile app; Twitter gets the other 10. And the particulars of the deal with Twitter represent a change from last year: none of the three London games will be streamed digitally. (Last year, Yahoo streamed one of them; it was originally thought that this year, all three would be streamed.) 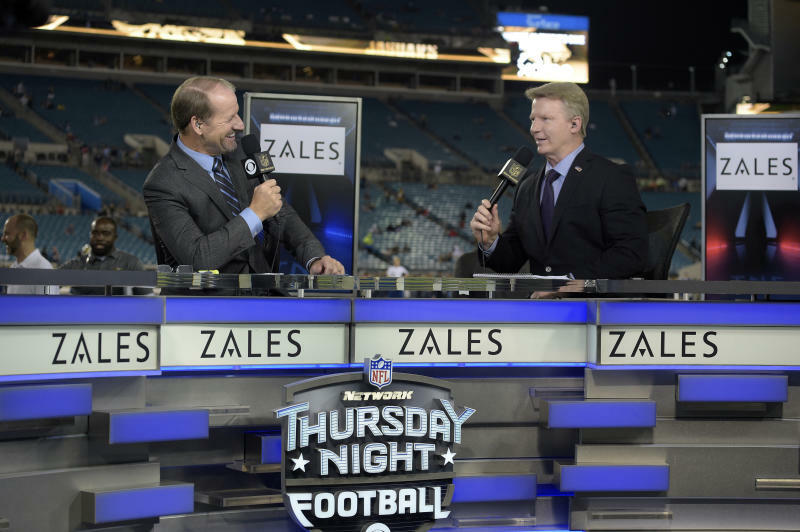 As the NFL puts it, giving Twitter the exclusive streaming rights completes the league’s new “Tri-Cast” model for Thursday Night Football: traditional broadcast (NBC and CBS); cable (NFL Network); and digital (Twitter). This deal is mutually beneficial for both parties. The NFL wants to get more popular abroad; Twitter can do that. Twitter wants to grow its business financially; football can do that. This story was updated with new information at 5:05 p.m. on April 5.